Way to go, CC! Cheers! @OhioGardener wrote: My seed starting continued today. 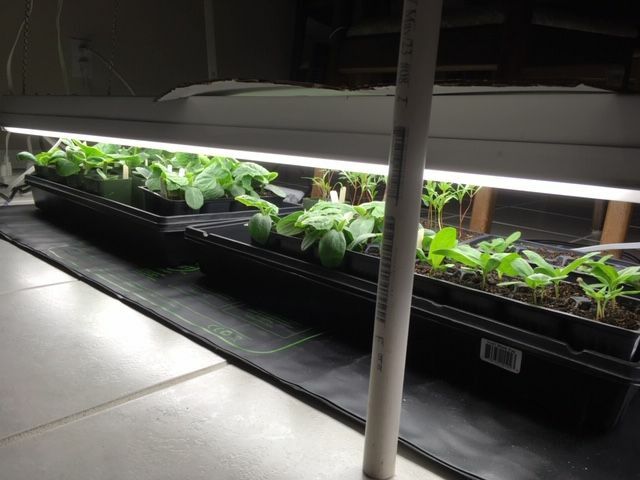 Planted Kale, Swiss Chard, and Pepper - Jalapeno, Bell, and Banana - seeds in CowPots, put a clear plastic dome over them, and set them on heat mats. Really surprised today to see that all of the Swiss Chard and Kale seeds I planted Wednesday are all up and growing. Don't think I've ever seen seeds coming up in just 3 days. Wonder if it is due to the enhanced seed starting mix I made this year? My kale comes up that fast in Jiffy Pellets, but only on a heating pad. I thought I could start seeds inside in a regular container with no extra heat, since it's a cold weather crop, but even in a house that never gets below 65 degrees, my seeds take forever to sprout without the extra heat. According to my research, none of the sweet onion varieties will grow here, because we aren't a "long day" region for onions. If anyone knows of a variety I can grow here that's as sweet as Walla Walla's, please let me know. CN, don't know if they'll grow in your area, but and excellent short day sweet onion is the Texas Super Sweet 1015Y. Check out Dixondale Farms onion page (https://www.dixondalefarms.com/category/onion_plants) for good descriptions of various short day onions. GRRRRR! Sustainable is no longer my fave. They've changed their policy and now only give free shipping on $50 orders. I don't want those seeds bad enough to pay $6 for them. @countrynaturals wrote: GRRRRR! Sustainable is no longer my fave. They've changed their policy and now only give free shipping on $50 orders. I don't want those seeds bad enough to pay $6 for them. I tried the new seed mats but the seeds sprouted slower than without them. So now they are just nice pads for the trays. I'm leaving the lights on 24 hrs which is also new for me. In the first photo are 2 trays of larger sprouts. The first 2 trays are containers with seeds that still haven't sprouted. The 2nd two trays have containers with sprouted seeds that are still short. Sanderson, your starts look beautiful! Thank you. Are you up early or up late (time change)? MIGOSH! Only 2 days and my romaine & baby pak choi are already up. YEE-HAH! Let the games begin! CN, Have you started sweet potato slips? That new pile of dirt looks tempting. @sanderson wrote: CN, Have you started sweet potato slips? That new pile of dirt looks tempting. Hmm, maybe I could put them in the ground, inside the Salad Bar, where the #@$% deer can't get to them like they did last year. The salad bar is definitely deep enough for SP. But, I wouldn't plant the actual tuber/root, just the sprouted slips with some roots growing. I tried planting some some SP as an experiment and it got weird, inedible results. @sanderson wrote: The salad bar is definitely deep enough for SP. But, I wouldn't plant the actual tuber/root, just the sprouted slips with some roots growing. I tried planting some some SP as an experiment and it got weird, inedible results. That's right -- I forgot. That sp experiment was a huge success, but then the deer ate them down to the ground and they never came back. I'll have to think about this a little more. Baby Bok Chois are up! Lights on, and lowered! My seed starting is about over. I have transplanted all cool weather crops to the garden. I still have tomatoes and peppers to plant out when it warms up a little more. Everything else should be direct seeded around April 1. I just bought some herb transplants to plant outside my back door. I am growing from seed - basil, dill, stevia, parsley. The Stevia has not germinated yet. If anyone hasn't bought all of the seeds needed yet, High Mowing Seeds has a 10% off sale through April 1st (Use Code SPRINGS33DS) when checking out. They also have free shipping for orders over $10. I started some seeds last Saturday. Three days later, many of the brocs were up. All of the older artichoke seeds I planted (four) all sprouted yesterday. I'm currently waiting for the onions to appear. I have never grown shell peas! Almost all of this year's seedlings are up and growing now. I have 18 peppers of various varieties, 6 Swiss Chard, 3 Red Russian Kale and 3 Dinosaur Kale, 4 Brussels Sprouts, 6 Bok Choy, and 144 onions. 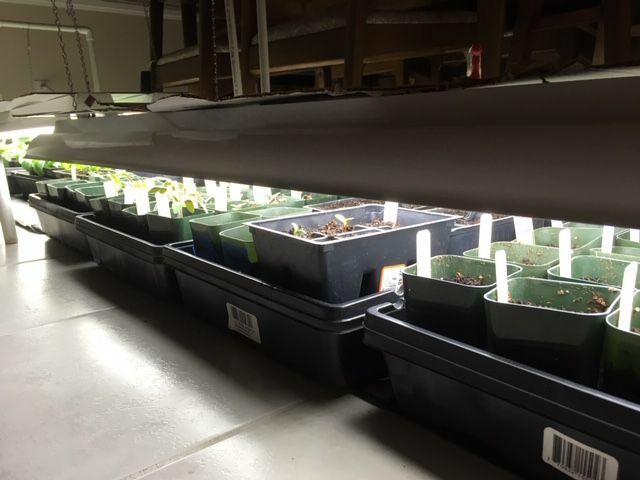 As soon as I can clear space on the growing racks, I will be getting the tomato seeds started, and then the spring indoor planting will be complete. I still have one shelf of the growing rack with lettuce that was grown indoors this winter for salads, and usually they would be outdoors by now - but, the weather has been far too cold to move them out, so the tomatoes haven't started yet. The onions normally go into the gardens on April 1st, but this year will be anyone's guess. After 2 references to Mel's book this week, on topics I had forgotten, I thought it was time for a little refresher course. I use Jiffy Pellets and I've always had trouble with roots getting tangled from one to another, because I always religiously followed the rule to wait for the first true leaves before transplanting. Darned if Mel doesn't suggest transplanting as soon as the seeds sprout -- for the exact same reason -- tangled roots. Yee-hah! Learn something new every time I pick up the book. So, tomorrow the baby cabbage, baby pak choi, & romaine will all go out into their permanent containers on the balconies. My first real plantings of 2019. My seed starting has reached a temporary roadblock. I need to get the tomato and basil seeds started - a tray of each - but I don't have room on my seed starting rack for 2 more trays. 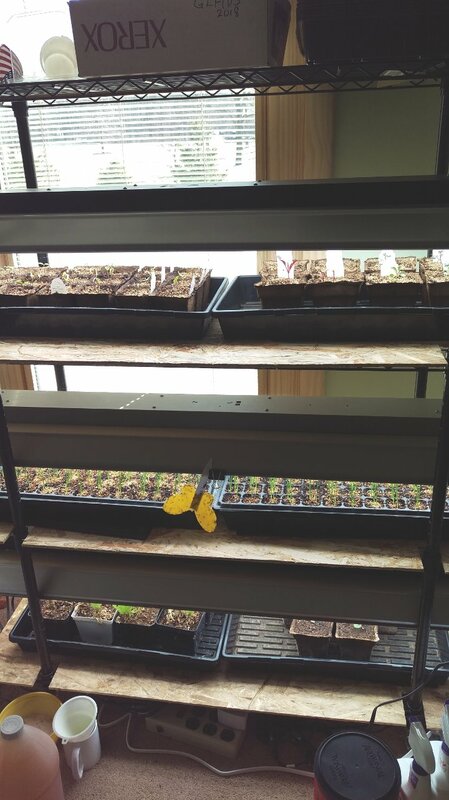 Normally, by this point in time of seed starting, the cool weather seedlings - kale, chard, onions, etc. - are already being hardened off and getting ready to go into the garden. But, this year we are still experiencing nighttime temps in the low-20's, and daytime highs in the low- to mid-40's. So, I've not been able to free up shelves on the seed starting rack for the new trays. I see a few empty holes, OG. You could give a few tomato and basil plants a head start. My seedlings spent the day outside. Cloudy but 70*F.
@sanderson wrote: My seedlings spent the day outside. Cloudy but 70*F.
I don't have the drive to start seeds right now. I need an attitude change.